I’m not good at keep plants alive but for a long time now I’ve wanted to (successfully) do a herb/vege garden with the children. Something simple and basic, so there’s that connection between the ground and the food we eat. I talked to one of my friends about it, she works for About the Garden Magazine, and asked her to help me and — yay — we are on our way! I’ve broken this gardening project into steps to make it manageable, and so it fits easily around family life (rather than allocating an entire day to attempt to achieve it all). Because we don’t have a garden bed, I will be doing this herb garden out of the ground. I hope this inspires others to grow a few things in their own gardens, because if I can do it (which remains to be seen) than anyone can! 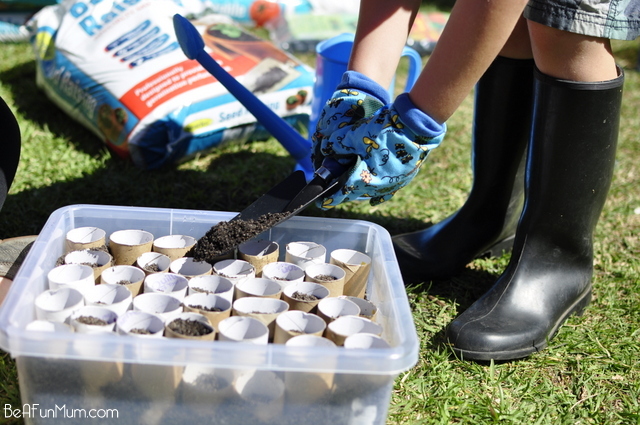 This first part of the gardening project is easy and simple (and fun for the kids). 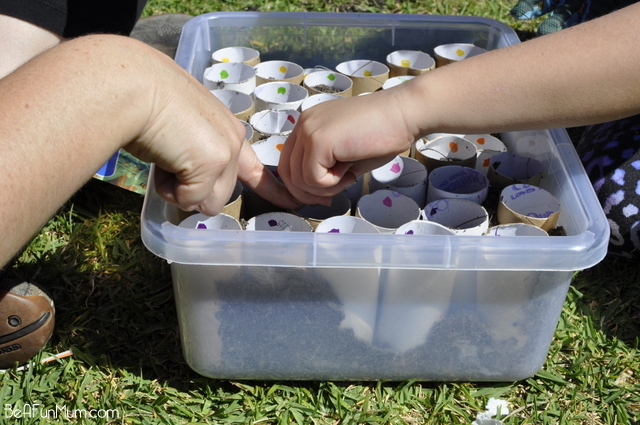 We plant seeds into toilet rolls until they are seedlings and ready to be transplanted to the garden bed. 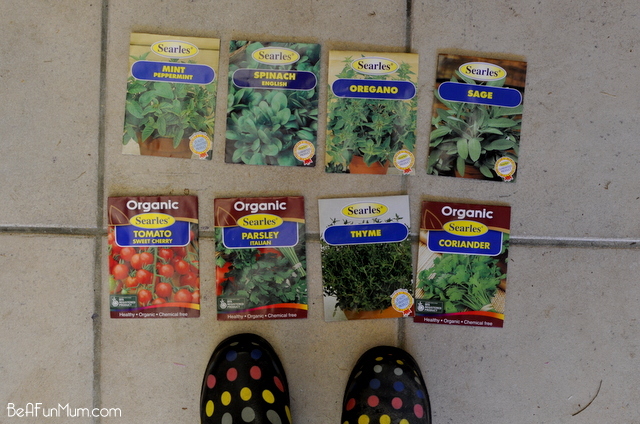 Below are the seeds I’m using for my herb patch. Line toilet rolls vertically along the base of the plastic container. Place as many toilet rolls as the container will allow. 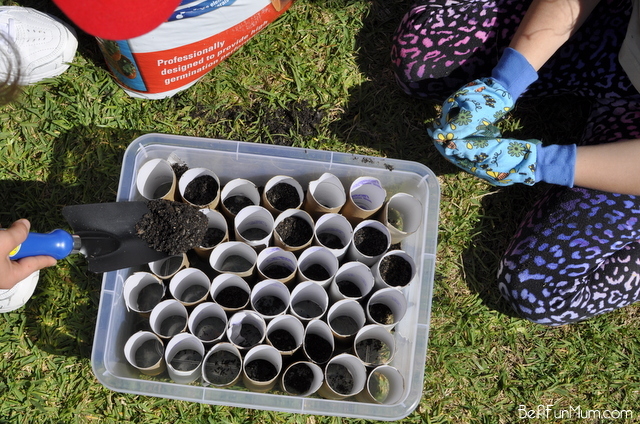 Fill the toilet rolls with the soil seedling mix, about half way up the toilet roll. 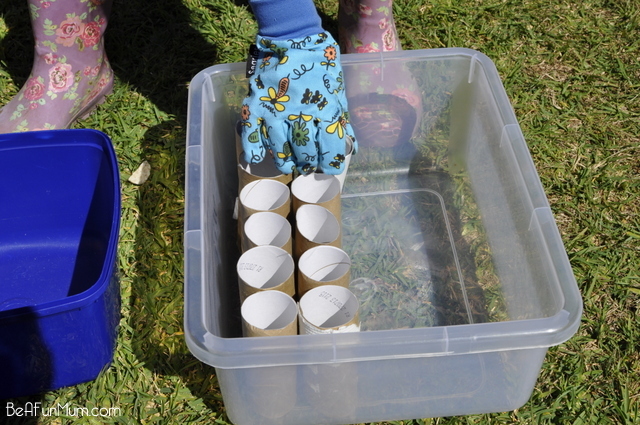 It doesn’t matter if the soil goes out of the toilet rolls and into the plastic container. For identification purposes, choose different colours for each herb. 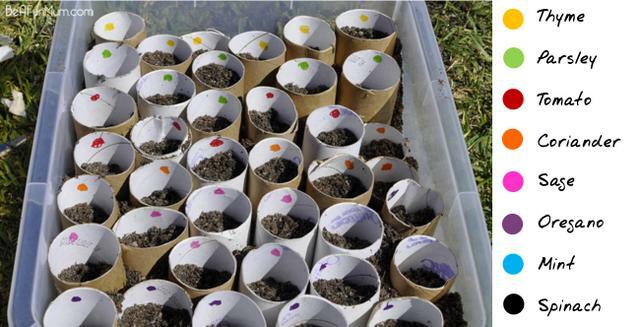 Then mark each toilet roll and the relevant seed packet with the corresponding colour. 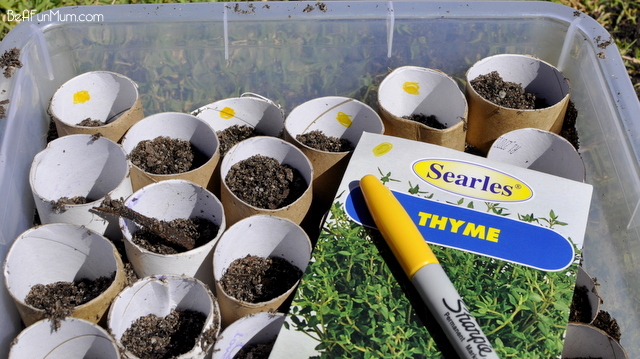 Place a few seeds in each toilet roll, according to the colour coding. Some of the seeds are so tiny, that we sprinkled a few and hoped for the best. It’s interesting to talk about the shape, colour and size of the different seeds with the children. 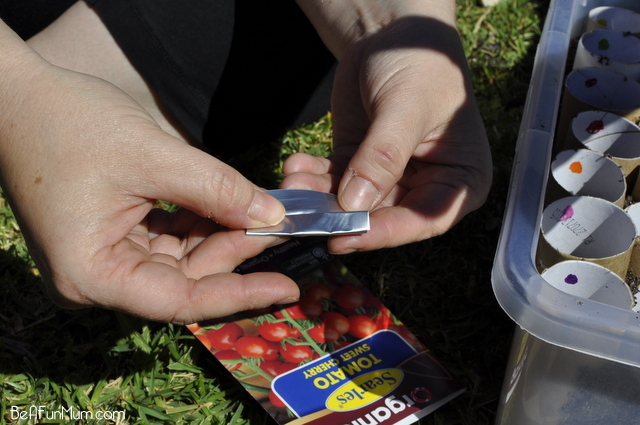 Fold the sachet containing the remaining seeds over a few times. Then, place the sachet back in the identification packet and store in a container or zip lock bag. 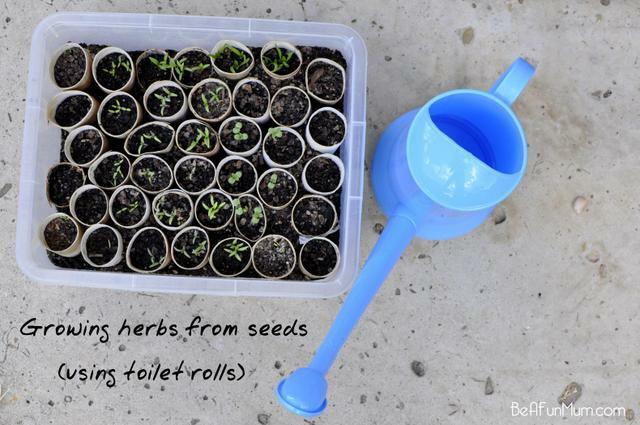 Cover the seeds with the soil, until the toilet roll is about 3/4 full. Son waited patiently for the watering part. 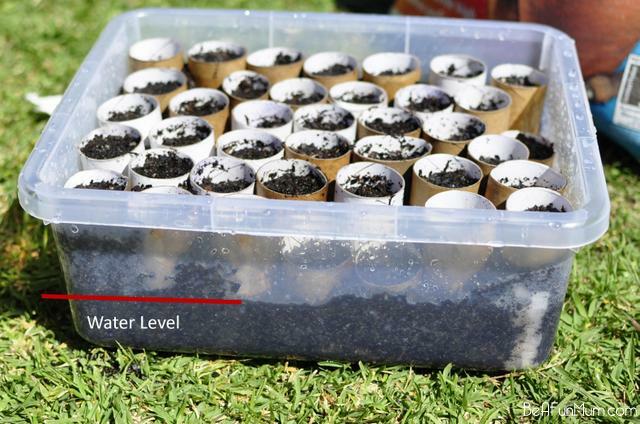 Give the seeds a good water, until the water level is sitting about half way up the container. Most herbs need a sunny position (guides are on the back of each packet), so we found a nice spot and watered our mini garden every couple of days. HELLO! After only a week we had spouts. It really does feel like magic when you see the green shooting up from the dark earth. The kids were so excited. 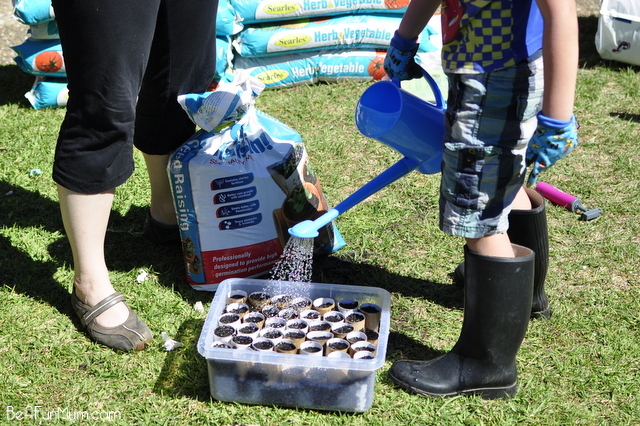 Now, after a few weeks, we are ready to plant the seeds into our make-shift garden. Watch out for the next post in this gardening series. I have been wondering what I was going to do with the two bags full of toilet rolls and now I know!! Can’t wait to see them when they’ve grown. 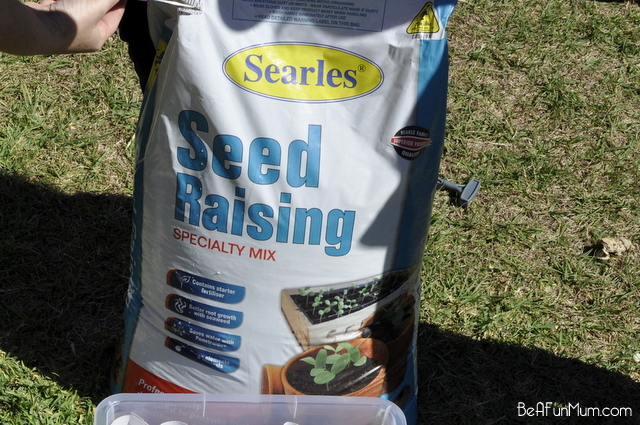 Ill have to give this a try although my track record of growing seedlings is quite poor! Yahooo……….They are looking fabulous Kelly, so delighted to see them sprouting…… you DID it! Can’t wait to see them ‘graduate’ to the big garden. 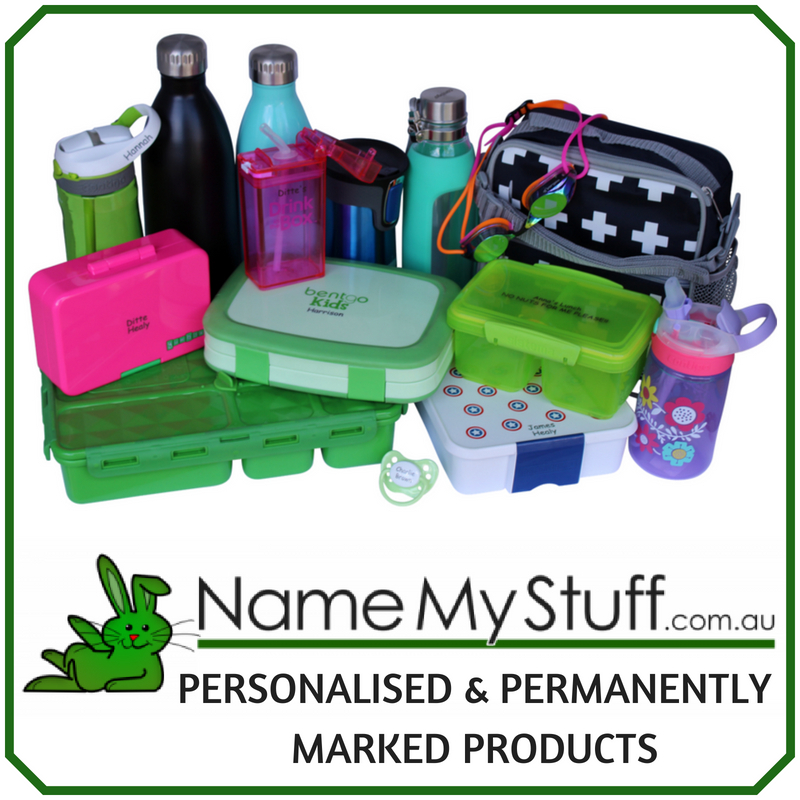 Hi Kelly, I have wanted to do a garden with my girls for ages, but have no clue where to start. I will be following your efforts with great interest! Just wanted to say too, that I have read your blog regularly for quite some time (couple of years! ), and I love it! 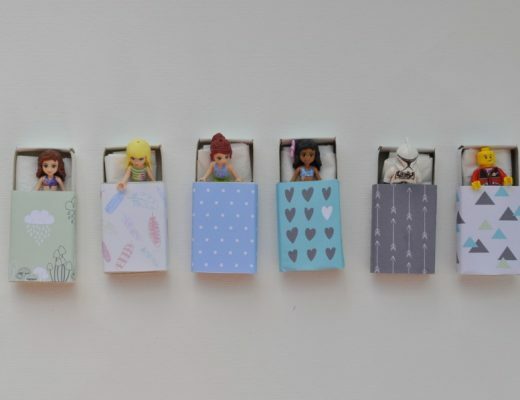 You seem to have great relationships with your kids, are so positive (love it!) 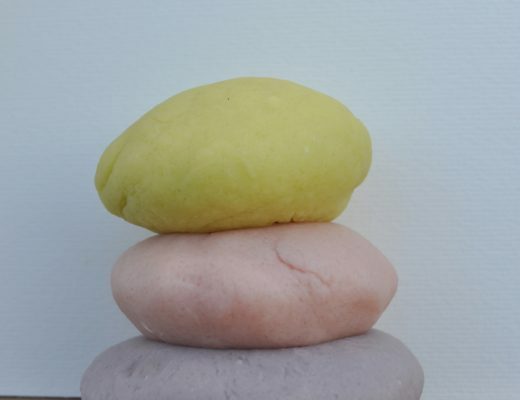 and have some really helpful and inspiring blog posts. God bless you! Mel. It’s so exciting when the seeds come up isn’t it? My kids love gardening and this is such a good time of year to plant things. I love your colour coding method! When we first started growing from seed we used toilet rolls and they worked really well. 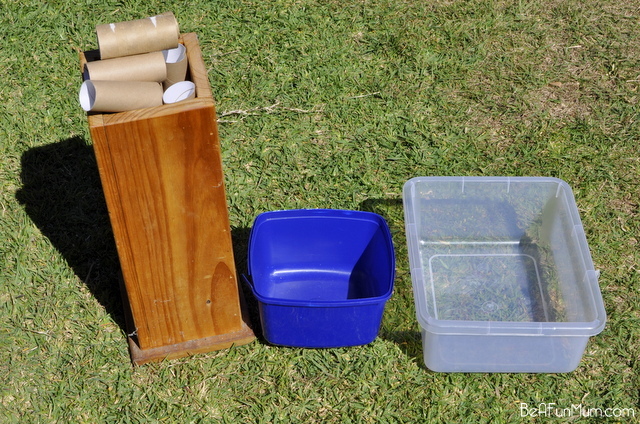 But we found that with our often cold springs that we needed bigger pots so we could keep our seeds inside and protected for longer before planting, so now we fold newspaper pots which also work well. There is nothing like seeing your seeds spring into life! Love planting seeds with my girls and always mean to try the toilet roll idea so thanks for the reminder! The colour coding is absolute genius as i always have trouble naming so many seedlings! !Wish I had a friend like yours with all the gardening we do hehe….your gardening is flourishing! 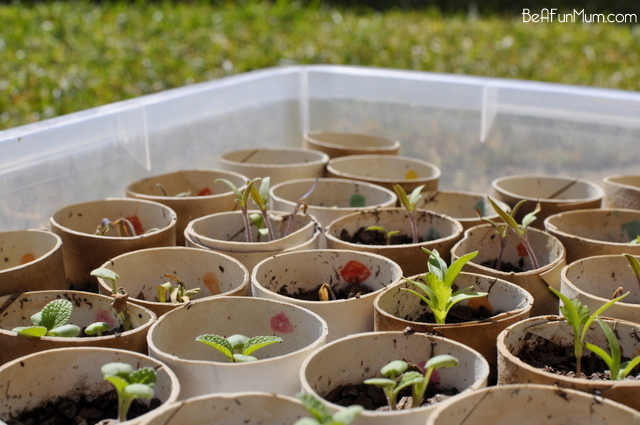 Love the idea of using toilet rolls for seedlings. Miss Daisy (and Li’l Peppa) love our vege patch! They are so at home there and will often pick things straight out and munch on them…even if they don’t like the taste of cabbage leaves after all! 🙂 It’s such a nice time together each day tending to our garden! 🙂 Look forward to more gardening posts from you! What a great idea! I am such a non gardener but aspire to be more so mainly for the kids’ sake. I think even I could manage this and I know my kids would be so delighted to see that little seedling poking out of the toilet roll holder. Time to start saving the toilet rolls! 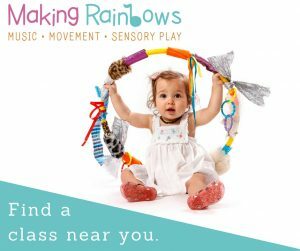 Thanks for a great post with easy to follow instructions!